JN: My mother used to sing every now and then, but neither of my parents have ever played any instrument. I started playing guitar in 1978, and bought a lousy guitar, half-acoustic, always out of tune. In 1979 a friend of my parents gave me a home-organ, the sort with a drum-program in it, with about eight different styles (pop, rock, bossa nova etc) and I learned a few things on that. In 1980 me and two friends of mine started our first band together and as I was the lousiest guitarist of the three it was decided that I'd play the bass. I have never taken any lessons on any instrument until 1994 when I started taking a few singing lessons. SH: So where did you first meet Sören? Did you ever play with him in other bands like Achelieus before you two decided to make music together? JN: I first met Sören in a second-hand record shop in Stockholm in '89.We bumped into each other a couple of times, exchanged tapes and decided to do something together. 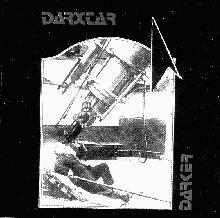 The first CD is the first recording we did as Darxtar. Sören had recorded earlier as Dark Star. JN: In the summer of '90 we recorded the first CD, but it was only intended as a cassette release on Acid Tapes. SH: On the first three CD's, many comparisons to Hawkwind were made? Were you guys really serious HW heads, travelling over to Göteborg in 1991 to see the band etc. JN: I was, and still am, a serious HW head. And yes I traveled to Göteborg in '91 to see HW and then back to Stockholm the day after to see them again. SH: What were some of the LP's you and Sören used to listen to in the early days? JN: Don't know about Sören but I grew up with Hawkwind (since '76) and Deep Purple, Black Sabbath, UFO, Pink Floyd, Genesis, Yes, Man, Pink Fairies, Help Yourself to name some of my earliest influences. Sören actually introduced me to Bevis Frond. SH: How did you and Sören actually go about putting together songs only being a duo or did you have a drummer that you jammed with but just did not work with when recording at Terra? It must be different not really being a band? JN: We sat at my place with guitars and ran through the songs we had very basically. Then Sören programmed the drums at home. He had a computer with a music program in it, that's how the keyboards and the drums were made on the first two CD's. We then recorded the guitars, bass and vocals and synthesizers along with the computer. JN: There was no drummer on the first two CD's. Sören did the programming on both, and on Darker. I adjusted the drum-rolls to sound more like something a real drummer could do. Steve Lines was and probably still is responsible for the Acid Tapes label. He also wrote the lyrics to The Fireclown on Darker and he made the cover to Daybreak. JN: Sören wrote a song to some lyrics from Trevor Hughes. JN: The record label was too lazy to make an indexing of the tape they were sent, claiming it was cool to have the CD as just one piece of music. The idea was fine the first time I listened to the CD, but I hate it now. SH: Some people might think that Bevis on the Radio is referring to Bevis Frond. But if I am correct, Bevis means Proof or Evidence in Swedish (it does in Danish)? JN: It's true, Bevis means Proof in Swedish but the song is about Bevis Frond. SH: How long was spent in the recording process for the first two records? Darker came out pretty soon after the debut. Were most of the songs for these two LP's completed at the same time? JN: The first CD was recorded in 1990 and it took a while before it was released on Acid Tapes. During the winter of '91 we wrote songs and decided on what songs to use for Darker. While recording my parts of the album Sören got the postcard from SPM World Wide that they wanted to release the first on CD. So that finally got released in December '91 and by that time we were finished with Darker. Though Darker wasn't out until '93. SH: How many copies of Darker and the debut were printed? JN: To my recollection there was 700 of Darker and 1000 copies of the first CD. SH: Were you, and perhaps you still are into science fiction a lot? Did you and Sören read a lot of books like Issac Assimov, Carl Sagan, William Gibson, etc. JN: I have always read a lot of SF. Asimov and Arthur C. Clarke have made the strongest impression on me. And also Michael Moorcock and Roger Zelazny (the one who wrote the books Jack Of Shadows and Damnation Alley). SH: Many claim that Daybreak is the band's best CD? It was the first that was recorded as a band. This does seem to come across. The drums and overall production sound is more powerful. How are the electronics different between the first two and Daybreak? It seems that the synthesizer feel is richer somehow? Does the band use vintage synthesizers or modern or both? JN: I think the sound was better due to better recording equipment. The synths we used on all three CD's were Korg MS-20, as both I and Sören had one each. On Daybreak we also used Sören Mårtensson's Korg MS-10. JN: It was very cool to bring the whole concept on stage. I always prefer playing live in front of people instead of spending time in a studio. Though both are fine in a different sort of way. SH: Sometime after the Europe tour you decided to leave the band? Why? JN: I was sacked. I won't get into any mud-slinging as of the nature of my sacking. Ask Sören. SH: Do you have favorite Darxtar songs? Can you ever see yourself playing some of the great material that you contributed to the band with any of your new bands? JN: Of course I have favourites. I'm very proud of "Metal Fatigue" "Valley Of Time" and "Voices Of My Dreams", but I think most of the material is very good. I'm not too fond of the debut because of the inferior production, but that one was never recorded with the intent of releasing it on CD. Though I like most of the tracks. SH: Any final words about the early years of the band? JN: We started out just to record some cool tunes and the fact that SPM wanted to release that first CD was a shock to me. Then it sort of just rolled along with Darker being released on Garageland. 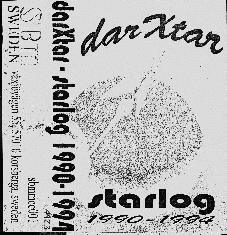 I think Darxtar became a band when we started on Daybreak, finding Patric on drums and later Fredrik and Sören M.
Hopefully in the April issue we will interview Sören about the later part of Darxtar, the future and of course his take on the early years.